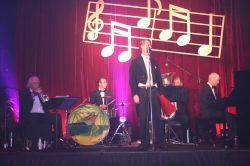 A specialist band offering swing jazz music from the 1920's and 1930's. Ideal for 1920's, mafia/mobster, Prohibition, Gatsby, Chicago, Hollywood or Charleston era theme parties, or simply as a classic jazz ensemble for the opening of cocktail parties, wedding receptions, top class private or corporate functions and events. 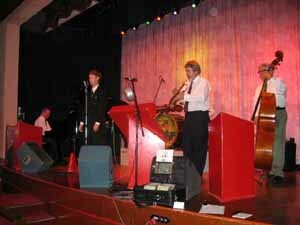 The Bakelite Dance Band are great fun for cocktail parties, casino evenings, wedding receptions and private parties. Sydney's only authentic 1920's Great Gatsby Dance Band will take you on a trip through time. In an instant, you'll find yourself at a Roaring 20s Gatsby dance party where time has stood still. The Bakelite Dance Band specialise in the dance music of the 1920s & 30s. It's the music they love. And that creates a special atmosphere your guests will love to dine and dance to. Many of the Bakelites are listed in the prestigious Oxford Companion to Australian Jazz. Respected jazz & swing musicians like Ray Aldridge, Chris Taperell, Dieter Vogt, Dave Ellis, Laurie Bennett, Joel Davis, Lloyd Taylor, Bob Henderson, Geoff Bull & Eric Holroyd. All have performed & recorded here and overseas. They will gladly meet with you before your event (Sydney metro only) They're happy to make planning for you as easy as possible...Brides, choose your special song for your entrance and/or bridal waltz from the song list below. Have another 1920s & 30s song you want played? Just ask once you have made your booking. If your special song is on CD, we can easily play it for you on the day through our high quality PA. Collectively, band members have played for hundreds of weddings. You can be confident that your 1920s & 30s music is in safe, experienced hands. The band keeps their performance times flexible and will fit into your schedule. They'll make every song count creating a happy, romantic mood. Guests will dance to their favourites all through the night. They bring their own high quality sound equipment to your occasion. Including a CD to play appropriate 1920s & 30s music during breaks. 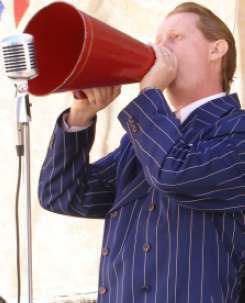 You can use their 1939-style birdcage microphone or the 1929-style crooner megaphone for your speeches. Saving you worry and money. The musicians all presented in 1930s' style suit and tie and backed by a real 1927 vintage drum kit. Trio of singer, keyboard and drums: ideal for private parties, boats and small lounge bars. Quintet add trumpet for any size function. *We can also add 1920's Dancers please enquire for details.